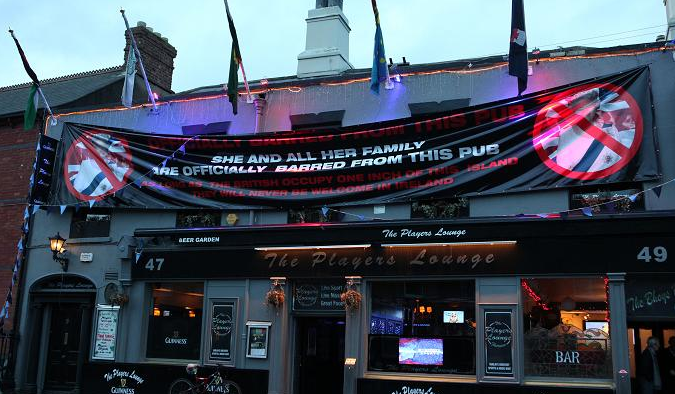 THE dad of Celtic star Anthony Stokes has hung a massive banner above his pub to protest at the Queen's visit to Ireland this year - claiming she "will never be welcome" in the country. 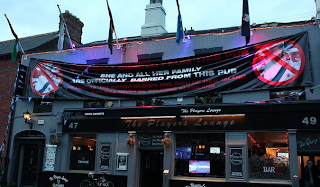 John Stokes put up the huge sign at his Dublin boozer saying Her Majesty and the royal family were banned from his bar. And the 54-year-old has already been hit with complaints since erecting the hate-filled protest outside his Players Lounge pub earlier this week. Last night he said: "I'm just warning her that she won't get served if she decides to drop in for a drink, to save me the embarrassment of having to tell her if she turns up, because it's a well-known pub and she might. "I don't believe she has any right coming here whatsoever. "When you hear the figures being thrown around about how much it will cost to bring her over, it's a disgrace. Surely money can be better used elsewhere? "My mother died of a brain haemorrhage when she was just 51 and they told us she could have been saved if she'd had a hospital bed. Why are we spending that money on this visit when we could invest in hospital beds?" Stokes - whose son has scored 12 times for the Hoops this season - admited: "I've had a few complaints already. "One guy told me that his father had fought in World War One and that I was a disgrace, but it's my opinion. She has no right to come here." But Irish Labour politician Ciaran Lynch said: "People should be positive about the visit. If you look at the last number of years, we've had Tony Blair visit, the Irish people voted overwhelmingly for the Good Friday Agreement, and times have moved on. "In terms of international exposure it will be a fantastic way of promoting Ireland as a welcoming country. We should all be very welcoming of the visit." The row is not the first time that Stokes' dad has been at the centre of controversy. In January he faced jail if he didn't pay a £2,075 fine. He was hit with the bill for refusing to pull down a shed at the pub - where a bouncer and two customers were shot last July. Following the attack, Dublin City Council ordered the publican to remove the "unauthorised" shed and a wooden pole.